This section contains the single most impressive engineering feature on the canal, the Paw Paw Tunnel. Located between mile 155 and 156, the 3100 foot long tunnel was constructed between 1836 and 1850 and was the final link joining Cumberland to the Chesapeake Bay. The decision to build the tunnel was made over several other options to traverse the shear cliffs in this area along the Maryland side of the river. One idea was to dam the river thus creating a lake for barge traffic, however this still required blasting a towpath into the cliff walls. 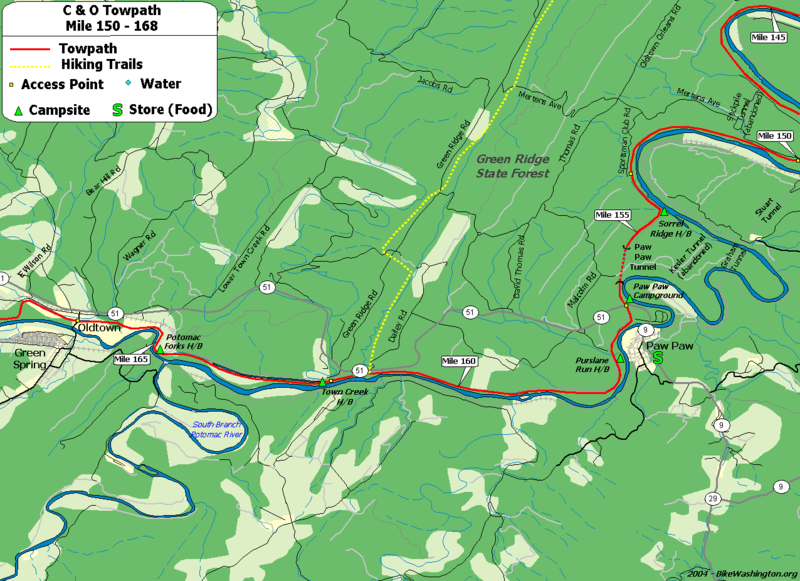 Another option was to create a series of aqueducts to cross back and forth between the Maryland and West Virginia sides. The tunnel option was eventually chosen mainly because it was expected to be completed in about 18 months (the actual construction took 14 years!). Be aware that the tunnel is VERY dark, so I highly advise you to carry a headlamp or flashlight. The park service has erected a sturdy railing along the walkway, so you need not fear falling into the canal basin (it is quite a drop!). 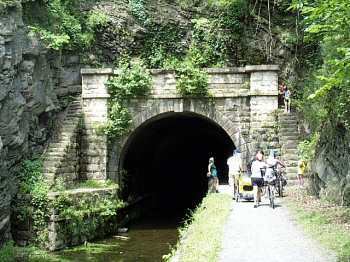 Soon after exiting the south portal, the towpath passes a camping area and then goes under Route 51. The town of Paw Paw, WV is about 1 mile down Route 51. The town has a general store/deli, a convenience mart, and at least one B & B. 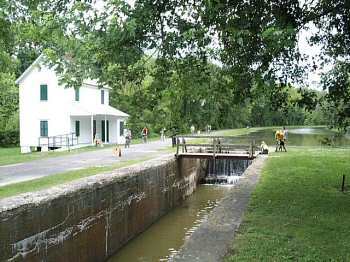 Other points of interest include the Town Creek Aqueduct (restored in 1977) and a fully restored section of the canal at the historic area called Oldtown . Oldtown was the sight of one the country's last privately owned toll bridge. In August 1995, Maryland closed this bridge due to serious safety concerns. However, repairs have been completed and the bridge is now "officially" re-opened ($1.00 toll). 166.7 Irvin Allen/Michael Cresap Museum (map) George Washington slept here - many times. One block heading away from the river, at the tee.